LOS ANGELES-The crowd Monday morning surrounding the makeshift memorial for rapper Nipsey Hussle took its time in growing. As the day expanded into the afternoon so did the number of people as they made their way down to Slauson Ave. and Crenshaw Blvd. in South Los Angeles to honor one of the more noted and respected figures in the rap game. There was a lot of crying and plenty of somber reflection on the life and legacy of Hussle, who established himself as a pillar of good works in the community. Yes, he was a Grammy-nominated artist. But in South Los Angeles, Hussle was an everyday Joe. He didn’t carry himself like a celebrity. Hussle, who was born Ermias Asghedom, walked among the people who purchased his music. He didn’t just give back into his community, Hussle embodied the neighborhood he invested in. Hussle was the example you could point to and be inspired by his climb from reportedly being in The Life to becoming a successful entrepreneur and goodwill ambassador. This is why the news of Hussle being shot to death at the age of 33 in front of The Marathon Clothing store he owned and operated, has resonated so personally with so many people. A sense of devastation rocked 57-year-old Ellege Penland when he found out that Hussle murdered. Like so many people who have come to know Hussle through his music and his business deeds and helping others throughout the city, Penland doesn’t understand why anyone would want to commit such a crime. Hussle became that somebody that many people came to look up to. This is why it is baffling to Penland that someone would carry out such a violent attack on a giving person like Hussle, he said. 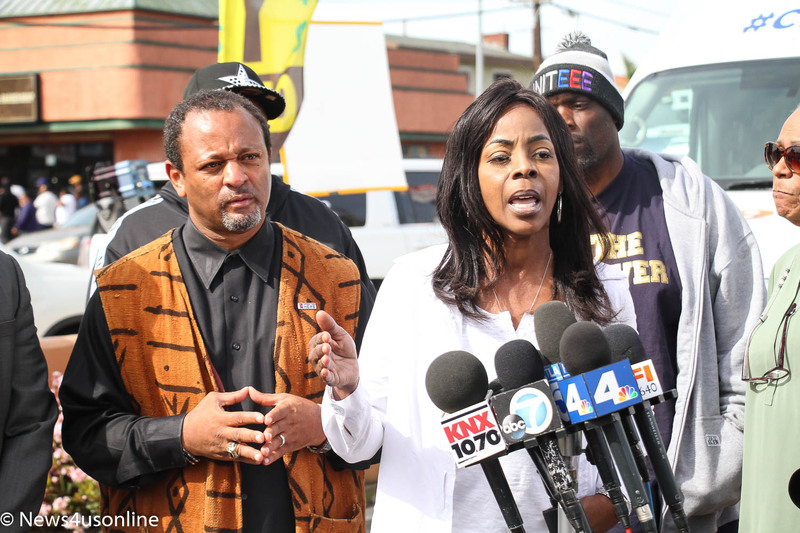 Like Penland, Lita “Sister” Heron, a longtime social justice frontline soldier and community activist in South Los Angeles, said Hussle’s death is a stark reminder of the warring violence that must be seriously addressed beyond the atypical press conference. Hussle meant a lot of things to a lot of people. He was a father. He was a partner. His philanthropy work and business acumen within the South Los Angeles community he lived and invested in, has made him a rock of positivity in his neighborhood and around the globe. He wanted his community to do better and be better. So, to help push that agenda, Hussle went out and bought a chain of businesses and put his money behind his microphone and started STEM center. Now, Hussle and all his wonderful aspirations to lift up the community he lived and grew up in is gone. Without warning, Hussle was mortally wounded after being shot multiple times. A community shocked and saddened by the news has been left to deal with the fallout. Activist Najee Ali, who held a press conference on Monday directly across the street from where Hussle was shot, talked about what Hussle meant to people in that neighborhood. He also invited other high-profile celebrities to come out and finished the mission that Hussle had begun. The shooting of Hussle left a lot of people in the South Los Angeles community at a loss for words. “Nipsey Hussle was a motivator. He was a philanthropist. He supported his community. He was a great man. He was a leader. He was very respectable. It’s a great loss for our generation,” said Jasmyne Harmon. When word spread that the South Los Angeles native was murdered in broad daylight on Sunday in front of his chain of businesses, fans from all over the city came out to pay tribute to the deceased entertainer. By Sunday evening, a throng of several hundred people made their way to the area. Some came out of curiosity, even bringing their children to the site. But for most of the people wrangling their way past police barricades, yellow tape and navigating through the blockage in traffic, Hussle was a man of the people. To many, Hussle walked the walked when it came to community philanthropy, re-investing back into the local neighborhood, and trying to create an awareness of local pride. Evelyn (Lynn) Esceves was born and grew up in South Los Angeles. She knows this neighborhood well. Despite the usual high rate of crime and violence in the community, Hussle stood above all of that with his charitable works and entrepreneurship. Esceves would not elaborate on her theory why she thinks Hussle was shot down, but her husband, Jaycee Esceves, said that Hussle was about as cool a person he had ever met. Jaycee Esceves said he had a couple of chance encounters with Hussle, and the rapper was never above reproach. The violent way in which Hussle died stunned him. With the evening winding down, the crowd at the Slauson and Crenshaw intersection grew bigger and more boisterous. The young as the middle-aged came out to honor Hussle. There were a lot of hugs, tears, and even dancing as the music of Hussle blared loudly from a truck speaker. There also seemed to be a lot of disbelief and anger as well with fans and followers of the rapper removing bush at the local Shell gas station to put up a memorial of candles and flowers. It also gave them an opportunity to peek inside to the area where Hussle lost his life as police were handling their business in trying to find out what happened. Jaisen, who requested that his last name not be used, said like everyone else, he was flabbergasted at the news of the shooting. His admiration for Hussle was not his music-making skills, but rather through his reputable business dealings.